As these things tend to go, my Virginia Glee Club history project has ebbs and flows. Sometimes there’s not a lot to write about; sometimes there’s too much. Like this past week, when I nailed down the identity of a few presidents of the Glee Club and discovered one was a third cousin. I should have known that when I found someone named Frantz Hershey, he would turn out to be a relative. It turns out that not only do I know him, I have him in my genealogy. 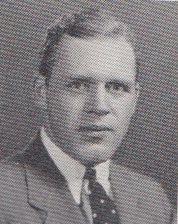 Ezra Frantz Hershey, Jr. was the president of the Glee Club in 1938–1939; he was also the son of E.F. Hershey, first cousin of Milton Hershey and treasurer of the Hershey Chocolate Company for over 40 years. Frantz is therefore my third cousin, twice removed. have you contacted Michael Butterman about the 80s? He would probably know 86-87 and he would most likely be able to contact older fossils to round out that list. Seals and Butler were also (I think) of that era and were VGs too.